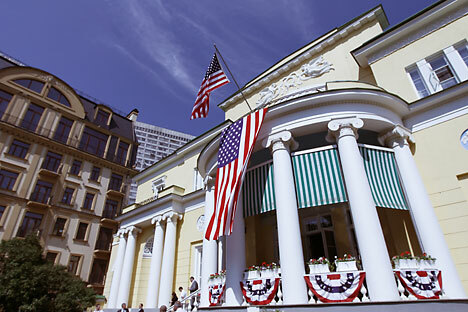 On April 25 The Women Entrepreneurs Conference was held at the residence of US Ambassador in Russia, Spaso House, Moscow. Among the attendees were Monica Dodi, the Co-Founder of the Women’s Venture Capital Fund, Tatyana Kazaveli, who is the CEO and Founder of the Open Cancer Network (and also a mentor for more than 500 startups in Russia) and many other women on whom Russian business depends today. The speakers were quite famous young business women Elena Shifrina, founder of Take a Bite, Anastasia Gulyavina, director at a charity festival Heart2Heart Bazar, and many others. The Women Entrepreneurs Conference is an event organized by the women for the women. “I don’t remember when I last saw so many beautiful, clever and, at the same time, successful women at once, -Wilhelm Pfaehler, professor at Kuehne Logistics University (KLU) in Hamburg and guest-lecturer at Skolcovo university, told RBTH. - I really admire them and I believe in their future success, some of them were my students in Skolcovo so I know what I’m talking about”. The Women Entrepreneurs Conference does a great job at bringing together women from all backgrounds. There were top CEOs, as well as first-time entrepreneurs or top women executives from corporate Russia. It was a chance for each attendee to get to know the other guests in an intimate setting and to discuss how women can continue innovating and advancing at the workplace. The conference gathered a lot of women running their own innovative startups. Women Entrepreneurs Conference is committed to accelerating the increasingly powerful role that women play in driving global economic growth. These women share the same approach to business: they all are using innovative technology to reach customers and utilize data in unprecedented ways. “Women especially understand that it’s not the technology itself that is important, but the connections, solutions and changes it enables you to make”, - one of the attendees told from the stage. WomenCon, Women Entrepreneurship and a lot of other international events are held every year, but The Women Entrepreneurs Conference was the first of a kind in Moscow. Russian businesswomen still have a long way to go and a lot to do for business and society.